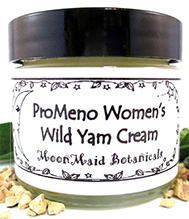 ProMeno Women’s Wild Yam Cream is MoonMaid’s herbal alternative to the bio-identical progesterone creams. This cream is a unique blend of the herbs designed to “assist the body in achieving hormone balance.” It feels silky, luxurious and smells fantastic!!! Use anywhere on the body and even as a face cream at night. Wild yam (Dioscorea villosa) and vitex (Agnus castus) with comfrey (Symphytum odfficinalis) infused in organic olive oil (Oleo europaea), then combined with organic aloe vera juice, flower hydrosol, organic shea butter, beeswax and a special blend of essential oils and flower essences. Though it is not know exactly how wild yam creams work as a replacement to progesterone creams but they sure seem to. Our customers who have had cancer, fibroids or cysts, and don’t want to use hormones, even natural ones, can tell you that ProMeno has helped them. Thanks for signing up! Please check your email for our confirmation email, and click the confirm link there. If you do not receive this email, please contact us! © 2013 Leslie Howard Yoga. Artwork © 2011 Katarzyna Kopanska. All Rights Reserved. Website by DA Studios and BrighterColors. Upcoming workshops are listed below. For more events, view the weekly classes and teacher training pages. For complete workshop schedule, see my workshops page.